This small but commanding collage by Kara Walker dates to about 1994 and is one of her first compositions to feature the silhouettes that have since become synonymous with her name. The intimate size and gemlike tones of this poignant collage imbue it with a visual power that draws the viewer in, only to reveal its difficult subject. 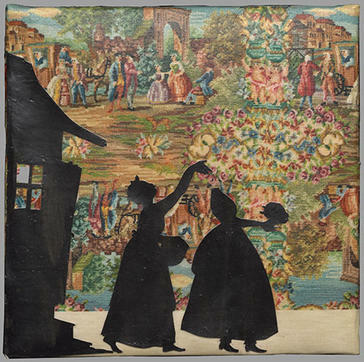 It depicts two black female figures in silhouette emerging from a shack. One woman carries her own head—separated from her body—before her in her outstretched hands.